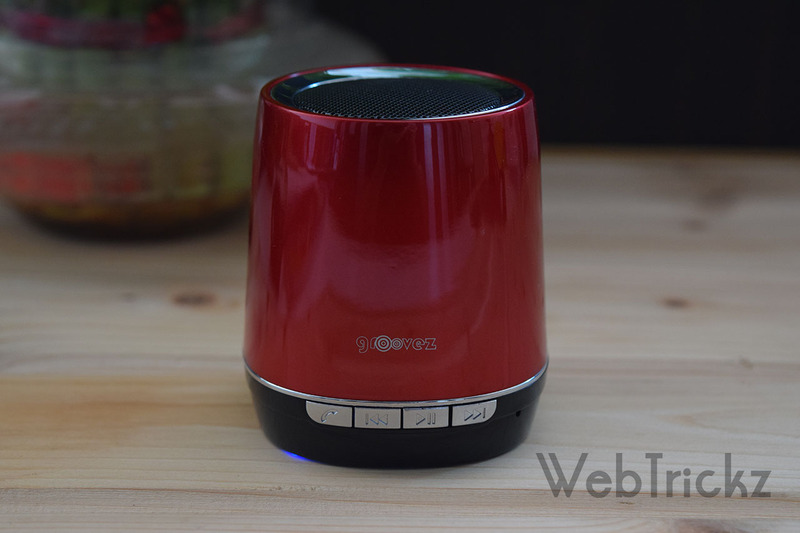 Since a while, the market of portable bluetooth speakers has grown exponentially and hence the demand for them. Now one can find endless number of brands selling different types of portable speakers in India, that can be either connected to a mobile phone, tablet, or laptop via bluetooth or an AUX cable. 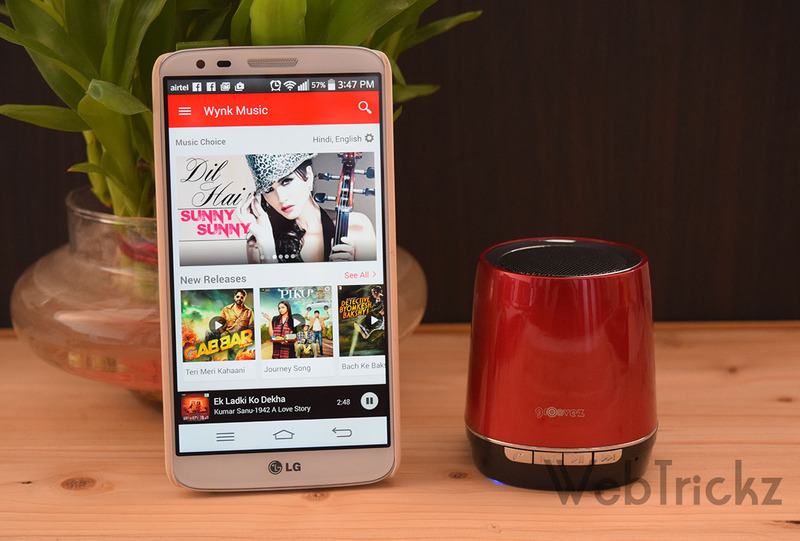 Besides basic music playback features, there are speakers offering functionality such as the ability to answer incoming calls, play music directly from micro SD card and FM radio support. One such portable device is ‘SMC650 Universal Bluetooth Speaker‘ by STK Accessories, a UK based brand recently entered into Indian market which caters to mobile phone and computing accessories. They have tie-up with Airtel stores, The Mobile Store and BrightStar and currently operates in 12 countries. STK’s Groovez series SMC650 is a portable and lightweight wireless speaker that lets you enjoy your favorite music playlist anywhere on the go! We’ve been using it since 10 days and can surely say ‘Groovez bluetooth speaker is a perfect companion for music lovers who like to party very often’. Check our review to know about its build, sound quality and connectivity options. Box contents – Speaker, 3.5 mm audio cable, Mini USB charging cable and user manual. Design – The speaker sports a decent form-factor with controls on the lower front side and power on/off switch at the bottom. It comes in a crimson red and black color with a semi-gloss finish thus boasting a metallic look. The speaker grill at the top in black looks quite inferior in quality but luckily the chrome plated ring surrounding it grabs the attention for good. Over the black portion, there are 4 control buttons for – Answer/end call, previous track/ volume down, play/ pause, next track/ volume up. Just like the grill, these silver painted buttons looks mediocre but offers a decent tactile feedback. There are two blue color LED lights on the bottom of speaker that flash every second during playback and their partial visibility gives a cool effect specially at night. The anti-slip base over the LEDs gives it a good grip when placed over a surface and prevents the speaker from wobbling or vibrating. 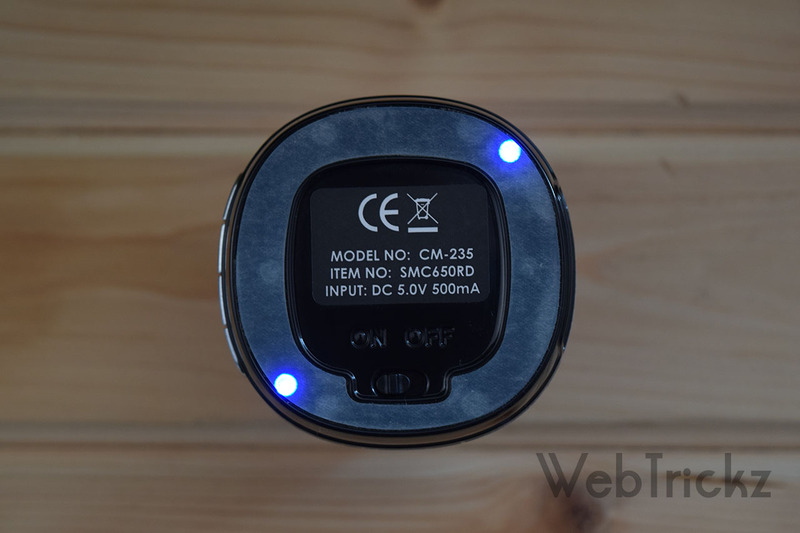 Overall, it’s a pocked-sized unit that measures 64mm x 69mm (WxH) and weighs just 163g, hence convenient to hold and carry. Connectivity – The speaker supports Bluetooth v2.1+EDR (with range up to 10 meters) and packs a 3.5mm audio jack (Aux in) making it possible to pair and connect almost any other device to play music. You can also enjoy music without connecting any device with the help of a Micro SD card upto 32GB, which supports MP3 and WMA file formats. 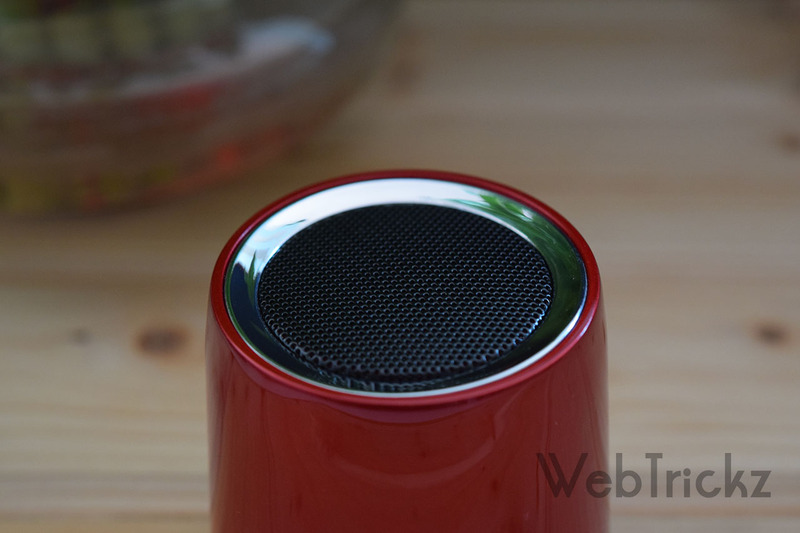 The built-in microphone can be used to make and receive calls via a Bluetooth enabled phone. It also features an FM radio with frequency range of 87mHz-108MHz and signal to noise ratio of 45dB. Sound – One shouldn’t judge its sound output by its small size as this tiny speaker by STK produces an unbelievably loud sound such that you won’t find the need to push it to max volume. This fairly-compact portable speaker packs a powerful 3W speaker that offers loud and clear music with decent level of bass. We tried it in several conditions such as indoor, room and open terrace; and to our surprise the sound output was loud enough and clearly audible even in noisy areas. The loudness doesn’t compromises the sound quality here, which is pretty crisp and clear but we did notice distortion in sound at the highest volume but that common with such devices. 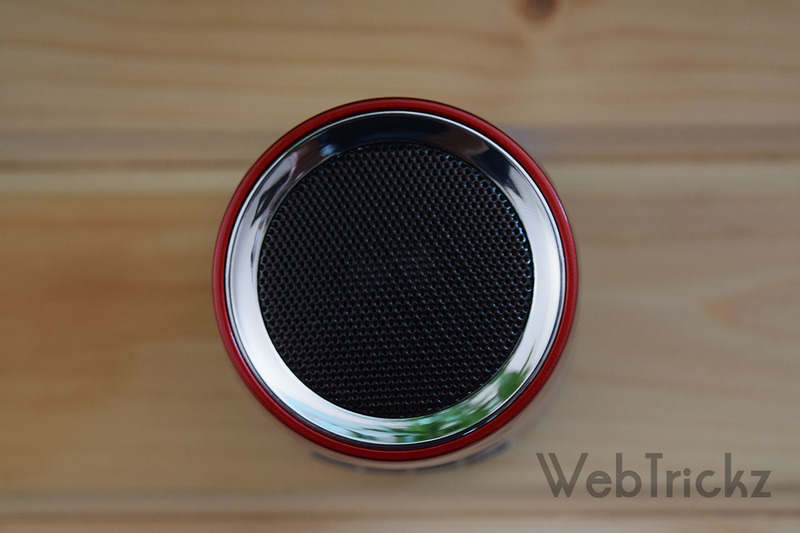 One can expect this tiny speaker to cover an area of around 200 sq ft. with good amount of quality sound, that kinda does the job for lite in-house parties and when watching movies on your smartphone/ tablet. We tested handsfree calling as well and the results were pretty good. The SMC650 packs a non-removable 300mAh rechargeable Li-Polymer battery that delivers a music playback time of up to 3 hours. The speaker has to be charged with a Mini USB cable and takes around 2 to 3 hours to fully charge. 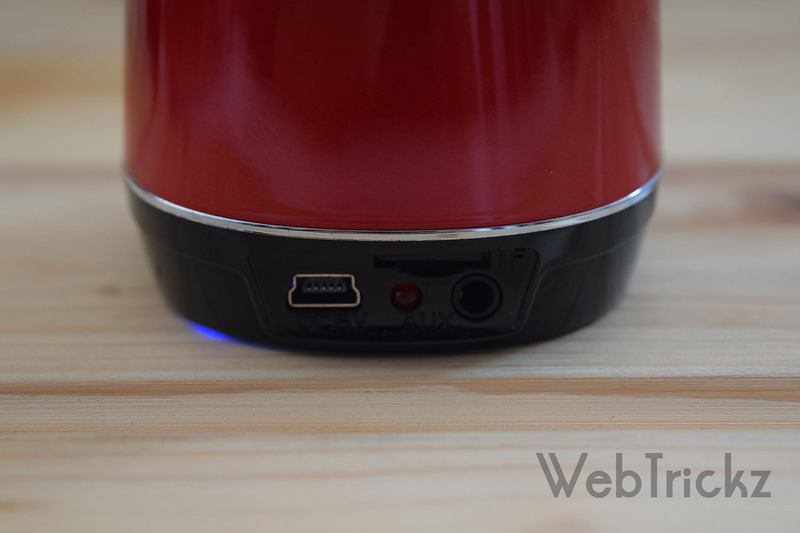 The red indicator light at the back shows the charging status which turns off when the speaker is completely charged.